Notes: PRR Class EF-15; Altoona, PA. 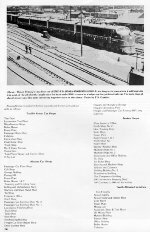 Description: Here is page three of a four-page article entitled "The World's Largest Railroad Shops." It was published originally in the April 1978 issue of "Rails Northeast" magazine, page 14. Partial Caption: "This is Pennsy's very first set of EMD F-3's (9500-A, 9500-B, 9501-B, 9501-A) backing to its train where it will begin its trip west." Shown here (R to L) are Pennsylvania Railroad engines #9501-A, #9501-B, #9500-B, and #9500-A. All were built by GM-EMD in 1947 and rated at 1,500 horsepower each. Photo by F.S. Gamber; taken from the 4th Street Bridge.